I have thought for some time that we need an Urban Core Community Council. We already have three community councils, and every district is in one. I think that the way the community councils were set up in 2012 is wrong because it means the same rural/suburban/urban mix we see on council is also happening on the two community councils for Dartmouth and East and Halifax and West. Here is the opinion I wrote in the Herald, and following that are some maps to show what I am talking about. It’s time for an urban centre community council. The recent decision by Halifax regional council to approve the towers on Wellington Street was a disappointment. Council ignored 30 years of planning, its staff and citizens of the area and the region. It’s a bad decision. I believe this decision never would have happened if the urban core were properly represented with its own community council. Councils are too big — and bogged down in rural and suburban issues — to respond to the needs of our regional centre. We need a new community council representing Halifax Peninsula and Dartmouth inside the circumferential. The night of the debate, Coun. Gloria McCluskey said she was voting for Wellington Street because bad development in Dartmouth had been approved and “now it’s Halifax’s turn.” I knew this was in Gloria’s heart because we had already talked about it. But two bad decisions don’t make good planning. She opposed a set of towers looming closely and inappropriately over the condos at the old Greenvale school site. Even more concerning, they will shadow the old Starrs Manufacturing site, where the municipality is to build the greenway and park connecting the waterfront to Sullivans Pond. I agree with her. Those buildings are totally out of place and undermine the vision of a renewed downtown Dartmouth. Nobody from the Halifax peninsula made that happen. The people who betrayed Dartmouth were Gloria’s fellow Harbour East Marine Drive community council representatives. How are these bad decisions made? Development proposals are first put to vote at community council, the first place a development can be turned down or a planning process scuttled. After the 2012 election, community council boundaries were redrawn due to the downsizing from 23 to 16 council districts. The new councils are huge. My community council, Halifax & West, stretches from Prospect and Timberlea, to Fairview, to the peninsula. Coun. McCluskey’s community council, Harbour East Marine Drive, stretches from downtown Dartmouth to the Eastern Shore. They are simply too large and too mixed up among rural, suburban and urban to work well for the urban centre. The way to solve this is to create an urban centre community council representing Dartmouth North, Dartmouth Centre, Halifax Peninsula North, Halifax South Downtown, and Halifax West Armdale. The municipality is going through a massive planning process called the Centre Plan. This will create harmonized and up-to-date plans for both the peninsula and Dartmouth inside the circumferential. Now is the time to create a new community council aligning our communities’ shared urban experience with this proposed planning framework. We need a logical approach to increasing population in the core. We know the numbers we want to achieve. We accept these goals. An urban centre community council would let the people who live here decide when, where and how we reach those goals. Here is what we have now. Three CCs, two of which are really urban, suburban, rural, and one of which is suburban rural. I cut the map down so you can see the detail in the core area. The CCs also reflect pre-amalgamation boundaries that are increasingly irrelevant in terms of planning and how people actually live in HRM. Here is what Option 1 of what an Urban Core Community Council that matches the planning boundaries would look like. In 18 months the area on the map, on both sides of the harbour, will have the same municipal planning strategy and land use bylaws. The old Halifax/Dartmouth differences, now seriously out of date, will be wiped away. This is what the Regional plan referse to as the Regional Centre area. 110,000 people live in this area, about 26% of the population of HRM. 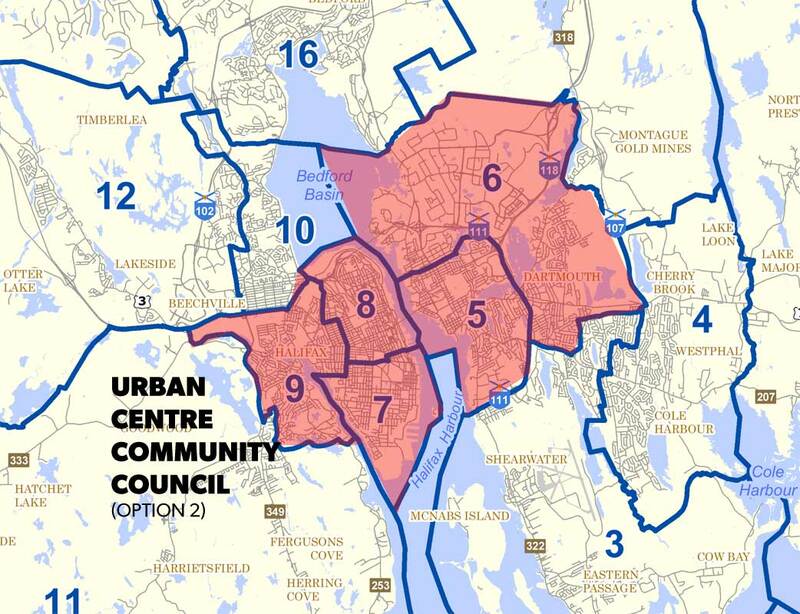 This option strictly adheres to the planning boundaries, but means councillors for District 9 Halifax West Armdale and District 6 Dartmouth North would have to do double duty, being on two community councils, one for the urban core and one for the more suburban part outside the regional centre boundary. In those areas the old planning is still in place, and will eventually be replaced, but not by the same rules as the regional centre. 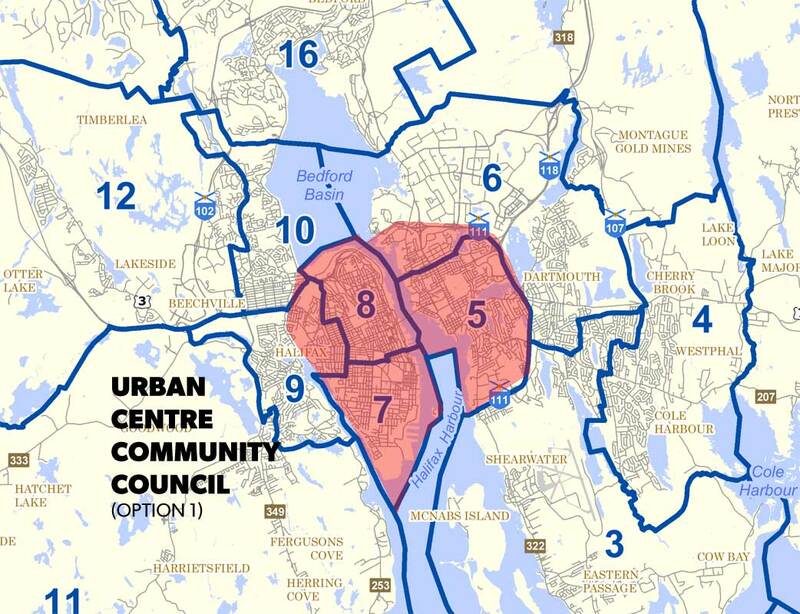 Here is what Option 2 of what an Urban Core Community Council that matches the political boundaries looks like. An advantage is that Burnside and the downtowns would all be in the same CC. Burnside is an important economic driver and has a lot of the same concerns that we have in downtown – more sidewalks, improved walkability, better transit, seeing more of the taxes generated there invested there. That might be good. Would it make sense for Woodlawn and Armdale to be in an urban core community council? Maybe. The councillors and the area residents would need to examine this very closely. I am not sure which is best for their interests. I think probably option 1 makes more sense for both the regional centre and the adjacent communities, which could stay in the current CCs.